Pharmacy Brand Epsom salts are used to help soothe and relax tight and sore muscles. 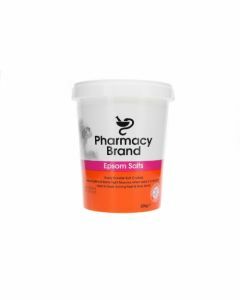 Pharmacy Brand Epsom Salts are clinically tested and confirmed to be kind and safe for skin with many beauty applications. They are dermatologically tested, suitable for use on sensitive skin, easily soluble crystals, 100 % natural and free of colours and preservatives. Relaxing & Detoxifying Bath: An Epsom salt soak helps draw out toxins and detoxify your body. For a relaxing and soothing bath, add approximately 100g to a standard warm bath which helps soothe and relax tight muscles. For a revitalizing experience, add a few drops of essential oil, such as lavender or chamomile. Soak your body in the tub for 15 to 20 minutes. When the time is up, take a warm shower to rinse off the salt and towel dry. You will feel very relaxed afterward so it is best to take an Epsom salt bath before bedtime. Foot care: Add roughly half a cupful to a basin/foot spa of warm water to soak aching feet and joints. Epsom salt softens skin and calluses. Soak for 5 to 10 minutes and use a file to smooth your heels, the balls and the outer edges of your feet. Rinse with water after bathing and towel dry your feet, especially between toes. Skin Scrub: Massage handfuls of Epsom salts over your wet skin, starting with your feet and continuing up towards the face. Rinse with warm water. Epsom salts softens and exfoliates your skin leaving it soft and smooth. Pharmacy Brand Epsom Salts are also suitable for horticultural use. Magnesium and sulphur, two major components of Epsom salt help seeds to germinate and make plants grow bushier and greener. It can be added to magnesium deficient soil or to magnesium hungry plants and crops such as roses, azaleas, rhododendrons, potatoes, tomatoes and peppers.